The IRS has been pursuing war tax resister Cindy Sheehan for months, and not long ago they hauled her into court to try to get a judge to order her to cough up financial information they could use against her. She fought back, with help from NWTRCC and its legal advisor. The IRS has apparently thrown in the towel! 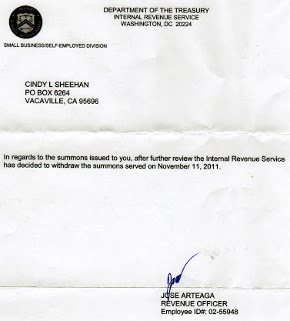 Sheehan posted to her blog a letter she got from the agency in which it informs her that they have withdrawn their summons. Ruth Benn and Ed Hedemann comment on the popular War Resisters League federal budget pie chart, why its numbers differ from those of some other groups, and some of the judgment calls that go into its calculations. A first look at the responses to NWTRCC’s questionnaire surveying people in the war tax resistance movement. Some notes on the taxable income baseline, how to adjust your withholding as a new employee, and the latest news on the telephone excise tax resistance front. A review of war tax resister Peg Morton’s new book Feeling Light Within, I Walk . Announcing the upcoming Spring 2013 NWTRCC national gathering in Asheville, North Carolina. A profile of war tax resister Andrea Ayvazian. 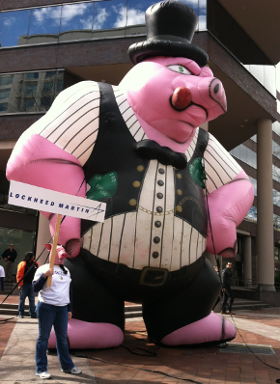 A coalition of groups have organized a “Pull the Pork (from the Pentagon)” national day of action to try to point out that the sacred cow of Pentagon spending is really a pricey pig in a poke. 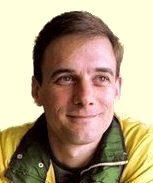 As a conscientious objector, García Barberà performed alternative service in the Barrio del Cristo, where he became involved in the Workers’ Catholic Action Brotherhood, to which he remains linked, as with the objector movement. “The objection is in all of life; it’s not only not doing military service, but it’s rethinking the role of the Army and of military spending. The movement did not end when objection was legalized nor when conscription was abolished,” he notes. Today he is associated with pacifist groups, never fails each year to make a symbolic assault on the NATO base in Bétera, and practices tax resistance, like a handful of Alaquàsers of his generation. “We omit the percentage that we estimate is dedicated to military spending (between 7% and 12%) and redirect it to Caritas or some NGO,” he explains, which on some occasions has meant conflict with the Treasury Department. “Armies defend borders when what ought to be defended is a dignified life for people. And even if they are dressed up as humanitarian actions, they serve large vested interests. In a war the strongest wins, not the most just,” he says. Amy Wachspress reminisces about her years as a war tax resister in the early 1980s on her blog. Armies of citizen informers… a behind-the-Iron-Curtain Orwellian nightmare, or the latest IRS business plan? IRS payments to what it calls “whistleblowers” who inform the agency on tax evaders jumped from $8 million in 2011 to $125.4 million in 2012 . A single $100-million payoff to an informer inside the Swiss bank UBS helped boost the total this year. War tax resister Andrea Ayvazian, in a column for The Progressive, wrote about what happens when she challenges our cultural taboos concerning money, particularly those that discourage women from taking the reins economically — and about the experiences of women who have taken the reins in a controversial and confrontational way by becoming war tax resisters.